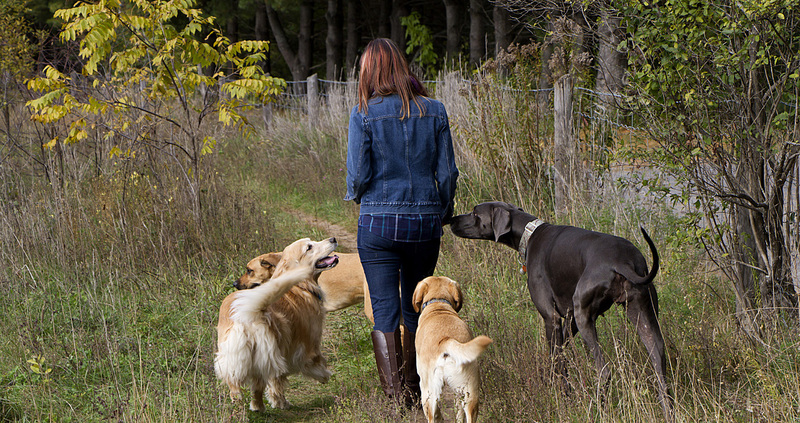 Does your dog prefer the company of people over large groups of dogs? We offer dog care in a family home with either no other dogs, or small numbers of well-matched dogs, where someone is home most of the time. We are a network of 25 care providers, not just one home! Have you ever had a dog sitter cancel on you at the last minute and leave you scrambling for dog care so you can still go on vacation? We work as a team, so there is always a backup plan and you will not be stranded looking for alternate care the night before your holiday. In 13 years we have never cancelled on a client. Our guest homes offer you and your dog a variety of different home care options. With a network of care providers all around the city, we are bound to have the perfect home for your dog! We have care providers in Nepean, Ottawa South, Kanata, Barrhaven, Hintonburg, downtown and Orleans. Some families have pets of their own and some do not. You may request to have your dog be the only guest in a home where there are no resident dogs. What's different about us? Our care providers are not also dog-walkers/pet sitters! They are not out all day walking other clients' dogs, or checking on cats - they are only looking after and walking the dogs in their home. All our families have someone home most of the time - you dog will not be alone all day while the care provider is at work or looking after other pets. You and your dog always get to meet the potential care providers and you don't pay a deposit until you have met a care provider you are happy with. We are not an online service - Bone Voyage is owned and operated by Christine Thomson, Ottawa dog lover, dog sitter and dog walker. Christine knows all the care providers personally and is in her eleventh year caring for Ottawa dogs. Our reasonable rates include everything - there are no extra charges for walks, playtime, trips to the park or basic medication - that's all part of the package! We offer discounts for long stays (over 2 weeks) and frequent travelers and we can offer VERY flexible drop off/pick up times. Any time that is convenient for both you and the care provider is fine! We may even have a care provider in your neighbourhood, making your dog care arrangements even simpler for you! We accept bookings for any period of time from one night to three months or more, but we do have a minimum 2 night stay for new clients on all long weekends. We can accommodate unusual requests such as airport pick-ups, dog care when you're selling/moving homes, or for out-town-towners attending a wedding or hockey tournament in Ottawa. If you have a request you aren't sure we can handle, please ask! **DAYCARE** - We are getting a lot of requests for daycare. We can sometimes arrange occasional daycare, but we are in the busy season now and most spots are taken up by boarding clients. Feel free to ask us if we can arrange what you need, but at busy times we don't usually have enough extra spots to accommodate clients that are only looking for daycare. We do not offer 5 day a week doggy daycare at any time of the year but are happy to try to arrange occasional daycare for your dog if space permits. Bone Voyage is fully insured by Pet Sitters International. Thanks once again to Carole and her family for taking such great care of Mocan while we were out of the country visiting family. Frequent updates and photos of Mocan keep us reassured that she is doing well and I know she is happy and safe at Carole’s house. We are so grateful to have Bone Voyage here in Ottawa providing such a great service. I couldn’t even imagine putting Mocan into a kennel type situation….so thank you all for all you do. Thank you so much for everything. I was so relax to leave my babies with Gail as she was amazing from the start and she kept me updated with news and pictures. Wonderful service! I can’t say enough good things about Bone Voyage. When I leave Lulu whether it’s for a day or a week I do not worry at all and I don’t feel any guilt �. I wish I would have found this great team 5 years ago!! I heard great things about Bone Voyage and decided to try them out to expand my network of doggie daycare. Christine and her team of care providers are awesome. My dog Coop had a wildly fun weekend and will be back for his summer vacation! Thank you Bone Voyage for treating Cooper just as well as I would at home!! © Bonevoyage 2006 - 2019 All rights reserved.